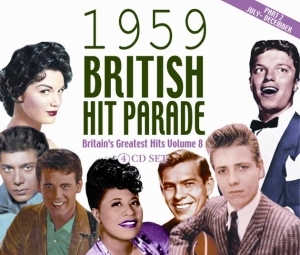 Acrobat’s series of comprehensive annual collections of British chart entries continues with the second half of 1959. A familiar pattern, established over the previous three years, saw regular chart entries for the US rock ‘n’ roll legends – Elvis, Little Richard, Eddie Cochran, the Everlys and the like – but, of course, we have already lost three major names, including Buddy Holly, in the fateful plane crash of 3rd February 1959. Alongside these, the roll call of British rockers is growing – Cliff Richard, Marty Wilde, Billy Fury, Adam Faith, Johnny Kidd and more. Meanwhile, the crooners, light entertainers, pianists, and novelty performers still hold significant sway – Perry Como, Frankie Vaughan, Ronnie Hilton, Ruby Murray, Russ Conway – while Lonnie Donegan rides the final waves of the skiffle boom as trad jazz starts to get a look-in. It’s an eclectic and fascinating musical mix, as the rock and soul vanguard still battles it out with Tin Pan Alley’s attempts to water down the “passing fad” of rock ‘n’ roll, now in its fourth year, and a second generation of teen idols, along with a rash of rock instrumentals, sees sub-genres emerging in the new music. Quite apart from the serious collectors, just about anyone who was around at the time will want this set, along with the many contemporary music fans fascinated by the roots of rock and pop.